Happy Word Art Wednesday everyone! With all the crazy weather we are having everywhere I am really happy to stay home and craft! How about you? 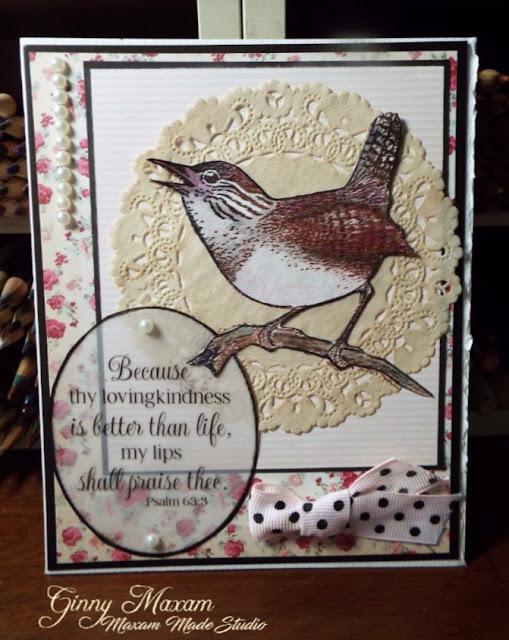 I hope you stop over to the Blog and join in the fun, We have a inspiring and uplifting devotion by Karen Letchworth and another beautiful bible verse digitized by Karen Murry! This week we have two wonderful sponsors! The first is - Bossy Joscie $25 AND Cutting Cafe (Digital Prize). You will really enjoy anything from either of these shops! To Play: go over to Word Art Wednesday and create a card, either with the verse or any family friendly card! Enter it and that is it, there will be a random draw winner announced in two weeks! Don't forget to mai8l that card and send someone a blessing! I'll show you more how to details in an upcoming post. Your card is absolutely beautiful! Love that sweet little wren!